I know that there are many important things in the world I could be blogging about today. I could be devoting my writing to analyzing the candidates for the presidential election. I could be posting about a prototype fusion reactor about to be turned on in Germany, which (if it works) could revolutionize clean energy production. I could be discussing the ongoing problems in the Middle East. But no. My topic for the day is: why the hell do I have the theme song from The Banana Splits stuck in my head? 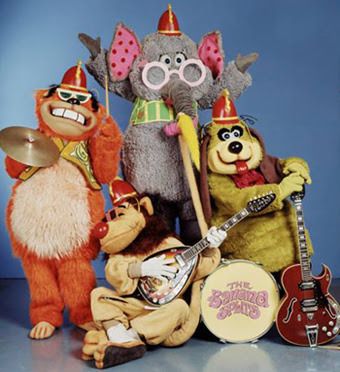 For those of you who are too young to remember the 60s, or who were, shall we say, otherwise occupied at the time, The Banana Splits was a short-lived and rather ill-conceived Saturday morning cartoon. It ran, insofar as I can remember, on the variety-show model, with a number of short clips (both animated and live-action), music, and so forth. It was hosted by a foursome of actors in animal suits (the eponymous "Banana Splits") -- Fleegle the dog, Snorky the elephant, Bingo the gorilla, and Drooper the lion. It was, in a word, weird. 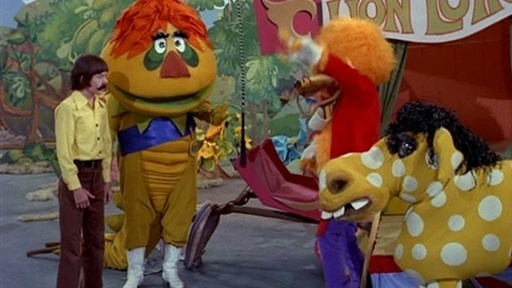 It is second only to H. R. Pufnstuf as being the trippiest Saturday morning cartoon ever aired. And for those of you who haven't heard of this amazingly freaky cartoon, the only way I can give you a flavor for it is to imagine what would happen if J. R. R. Tolkien wrote a script for an episode of Barney and Friends while on LSD. You think I'm kidding? Ask anyone over 50. 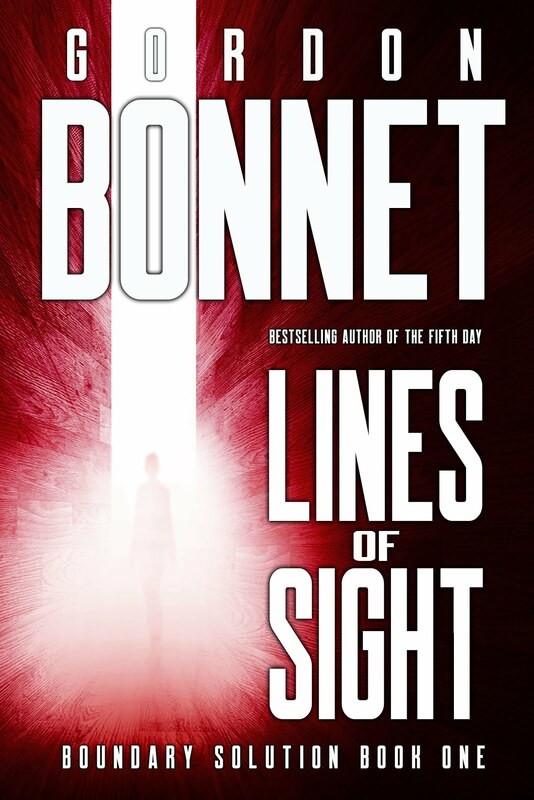 Or check out the Wikipedia entry, which gives an interesting take on the series, as well as many links to related sites. Anyhow, the theme song of The Banana Splits -- whose lyrics I kindly won't share, partly out of consideration for my readers and partly because the bit of it that is currently whirling around in my brain consists mostly of "la la la" -- is one of the worst earworms in the world. An earworm, as defined by psychologist James Kellaris, is a song, jingle, or fragment thereof, which gets lodged inside your skull and will never ever ever leave, even if you try to remove it using an electric drill and a shop-vac, until finally you go completely and totally MAD AND BEGIN TO FROTH AT THE MOUTH AND START CALLING ALL OF YOUR FRIENDS WHO ARE HUNTERS AND ASKING THEM IF THEY WOULD HAVE AN ETHICAL PROBLEM WITH KILLING AN ELEPHANT NAMED "SNORKY" EVEN THOUGH ELEPHANTS ARE AN ENDANGERED SPECIES. Whoa, sorry, got a little carried away, there. And perhaps I exaggerate a tad. Even the most annoying earworm will eventually leave, but often only because it's been supplanted by an even worse one. So once I have the theme song from The Banana Splits out of my head, who knows what musical adventures I have to look forward to? Maybe "Copacabana." Or "Benny and the Jets." Or the "Kit-Kat" jingle ("Gimme a break, gimme a break, break me off a piece of that Kit-Kat bar.") There are so many my brain can choose from! I can hardly wait! The worst of it is considering what a waste of mental energy this must be. When I think of the amount of brain space I'm currently devoting to keeping "la la la, la-la la la, la la la, la-la la la" ricocheting off the inside of my skull, it just makes me depressed. I could be writing a symphony, coming up with a Grand Unified Field Theory, solving world hunger, or figuring out why Carly Fiorina appears to be physiologically incapable of uttering a true statement. But no. I'm sitting here, going "la la la." And worse yet, writing about it. 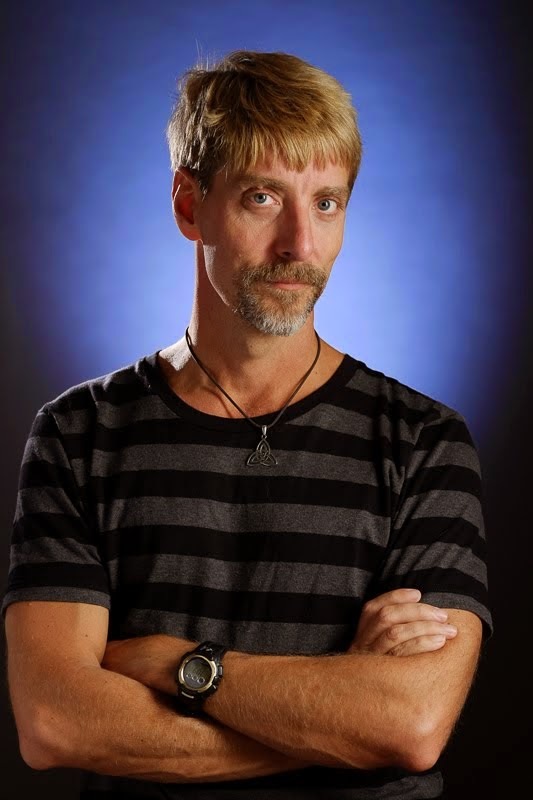 Good lord, I just realized something. Now I've infected all of you. I'm really sorry about that, truly I am. And if all of you go out and infect others, it'll be... it'll be.. a pandemic! Bananasplitsitis! US productivity will grind to a halt! (The Russians and Chinese are immune, because during the 60s they were too busy having Cultural Revolutions and Great Leaps Forward and Sputniks and Missile Crises to come up with pointless, psychedelic cartoons.) World markets will collapse. Pandemonium will ensue. And it will all be my fault. Wow. I feel just awful about this. I think I need to lay low this morning, just to recover from the guilt feelings. Find something to take my mind off all the trouble I've caused. Maybe relax, daydream a little. Daydream about... about a magic land... where everything is alive! Filled with whimsy and weirdness! Where the mayor is a brightly-colored dinosaur! Ahem... "H. R. Pufnstuf, where'd'ya go when things get rough, H. R. Pufnstuf, you can't do a little 'cause you can't do enough..."